We’re nearing the release of Prusa’s first resin-based 3D printer, and it’s time to think about what this might mean. Sure, there are plenty of resin machines on the market, some at very attractive prices. But there are some very different aspects to this situation that I suspect may cause some significant changes in the desktop 3D printing industry. There are three factors at play here: cost, reliability and scale. A successful machine must carry an affordable purchase cost; be highly reliable and easy to use; and be available in large quantities. Do these factors exist on current inexpensive resin 3D printing equipment? Largely no. Cheap machines don’t always work reliably or easily. If they do, they are not sold in large quantities. Enter Prusa Printers. This Czech company has come from nowhere a few years ago to today producing thousands of — perhaps even TEN thousand — 3D printers PER MONTH! What they produce in a single month outstrips what some other companies produce in a year. They’ve been able to accomplish this because they have figured out the magic combination of cost and reliability, and can also do this at scale. Their success has provided them with ample funding from sales and allowed them to branch into the world of resin 3D printing. The soon-to-appear SL1 device more than likely carries the same attributes, as the company clearly understands what it takes to succeed. The price of the SL1, for example, is only US$1,599, far lower than some other professionally-capable units. 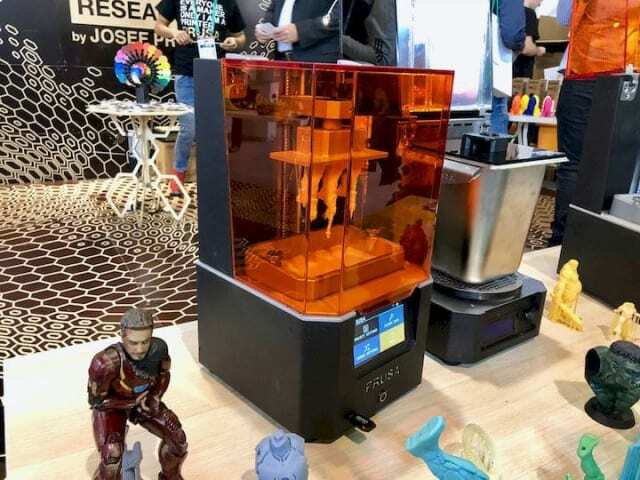 Formlabs has also used this approach with their resin equipment, providing a fabulously usable resin 3D printer at a cost far lower than the existing players, whose machines tended to cost in the US$50K range. Their cost advantage has enabled Formlabs to make vast numbers of sales worldwide and propelled their company to become one of the largest in the industry. Now we see Prusa Printers coming out with a much more inexpensive device than even Formlabs. While it remains to be seen how it compares to the Form 2 or Form 3, it is possible they may take a bite out of the resin market. And it could be a large bite, given Prusa’s propensity for large-scale sales.